What’s the best way to recover from a hard workout? If you’re training for an upcoming race, the need to quickly recover from your latest hard workout so you can get on to the next one is very important. 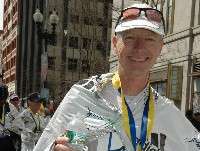 Proper nutrition, light stretching and a hot shower are not always enough. Compression socks offer a unique solution to stimulate blood flow and help your legs recover faster from a hard run or workout. These socks are no longer just for diabetics. Compression socks are now worn by average to elite athletes while running, cycling, and recovering from any kind of demanding workout. You can even recharge yourself for an early morning run by wearing compression socks to bed. I recently picked up my first pair of compression socks and started wearing them a few weeks ago. In this post, I will review two different compression socks from Bauerfeind USA. I’m always on the lookout for something to help alleviate occasional stiffness and discomfort in my lower legs and Achilles tendon. A foam roller and stretching usually is enough, but recently a dull ache in my Achilles has persisted. 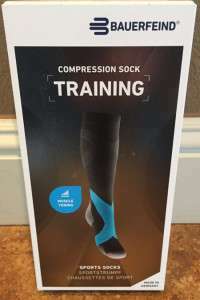 A number of training partners and my wife swear by the therapeutic effects of compression socks, but I had never used them as a part of my training/recovery regime. 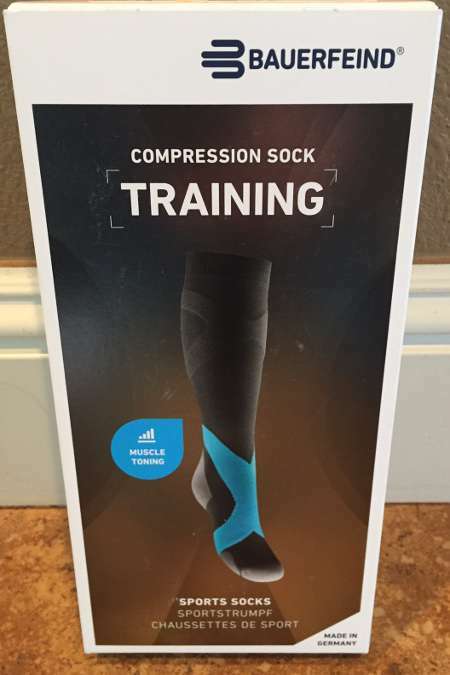 I completed a little research and found that compression socks actually improve leg muscle recovery, circulation and reduce calf muscle fatigue. 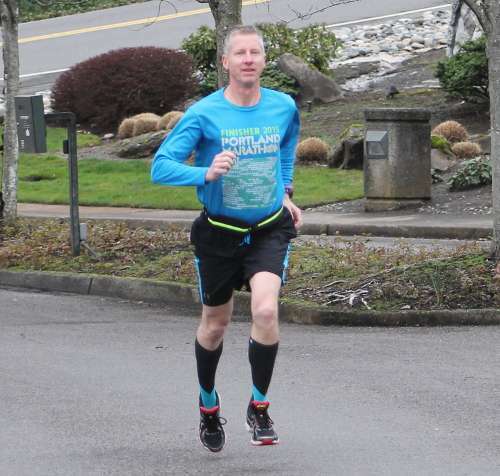 Compression socks are not just for older athletes. They are supposed to improve performance and speed recovery. I chose Bauerfeind based on the recommendation of a friend. Bauerfeind has been in business for nearly 90 years. With manufacturing in Germany, they are a leading supplier of supports, orthoses, medical compression stockings and orthopedic supports. One of their stated goals is “to help you maintain and regain health, increase well-being and ensure greater quality of life.” I started wearing the “Bauerfeind Sports Compression Sock Ball & Racket, formerly known as the Compression Sock Training” about 3 weeks ago. This sock is for muscle toning. I can comfortably wear it when I’m running and during recovery. This sock is almost “over-engineered” with “left” & “right” sewn into the top inside so you continue to use the same sock on the appropriate leg. The other sock I picked up was the traditional “Bauerfeind Sports Compression Sock Run & Walk, formerly known as the Compression Sock Performance” model. Both of these socks are exclusively developed for endurance sports and designed with multiple zones with specific benefits like recovery, energy and muscle toning. The Training sock is designed to improve personal performance and fitness. The Performance sock promotes energy. Each of these models of socks come in various sizes to fit large and small athletes. When I was making my selection, I measured the circumference at the widest part of my calf and provided my shoe size. I was concerned that the fit may be too tight and restrict circulation. Instead I found that the highly elastic, knitted, breathable technical microfiber is very comfortable. The Training Sock doesn’t make my skin feel itchy. I like the muscle toning zone around my calf and the protective zone below the calf muscle which is for reducing pressure and rubbing on my Achilles tendon. Another feature of this sock is the taping zone on top of the foot which crosses over the ankle. This zone is to improve stability. I’m not aware of any other compression sock with all of these features. I wore these socks on a few different runs, including a hill workout. After wearing this sock for a few weeks, I noticed that the discomfort in my Achilles was gone. Although I have continued to roll and stretch, I attribute some of the disappearance of my pain to the sock. My son who runs High School track has also been wearing both the training and performance compression socks. His preference is the performance sock. He likes these socks so much that I haven’t been able to wear them as much as I would prefer. Bottom-line, these are comfortable and they do an excellent job accelerating recovery. During the last 3 weeks, I also tested the Bauerfeind Performance sock. This sock is much more like your traditional tight fitting compression sock. It’s designed to promote energy through gentle compression. The blood supply to your muscles is improved in the energy boost zone around the calf muscle. This results in improved endurance. Instead of these socks feeling too tight, they use the gentle compression to stabilize the calf and help counteract premature fatigue. All zones of this sock are made of a breathable and durable material. I ran in these socks a few times, including a long run and a track workout. I found them to be comfortable and I think they definitely helped my legs feel fresh both during and after my workouts. I really like these socks, particularly the training compression sock. I believe that they help to improve my legs’ stamina during my tough workouts. The compression supplies a firm hug that actually made me feel more energized during workouts. There’s no doubt that compression socks support faster recovery times. The socks’ fabric seems to minimize any lingering odors, even after multiple wearings. Both of these sports socks feel lightweight and comfortable on my skin. Even in slightly warmer weather, the materials have a temperature and moisture-regulating effect. I particularly like the cut-out that’s in the sensitive area around my Achilles tendon. This prevents pressure and rubbing in that area, but also I felt like there was slight reinforcement around my Achilles which helped speed my recovery from the dull ache I had experienced in the previous month. My recommendation is to give the Bauerfeind compression socks a try, I’m sure you will be satisfied. Bauerfeind offers FREE UPS Ground Shipping on all orders!